Interest & Commitment has a lot of differences in them! I was interested in my career as selling life insurance 30 years ago. Today I'm committed to it, as selling life insurance is my personal hobby now. To be interested might be either way, to stay for a short period or to extend further later, depending on how fanciful and exciting is the work. Whereas committed is serious, I have to put my whole soul to the duties of this hobby now. Interest alone might not show result, while commitment always does. Same to a relationship between a couple. If a man is interested in a woman, the relationship might be uncertain. However if he is committed to their bonding, their loves would bloom greater and stronger. Merely interested, the man might take things lightly, whereas if he is truly committed to her, he would put extra effort and attention to his love. So! If you are working and not seemed to be progressing well... Ask yourself whether you are only interested or committed to your work. If you are only interested in the salary and benefits, and not committed to the responsibilities and duties, success is difficult to come by. And if your love relationship isn't heading no where, the truth is... there is no commitment on either side to support the love. 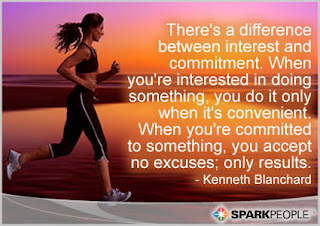 Interest or Commitment plays their roles differently. Agree?